Hemp seed has been used as a source of food throughout history. The protein in hemp is a complete protein, which also contains Omega 3 essential fatty acids. It is hypoallergenic and an excellent protein source for vegetarians. Hemp protein is produced with minimal processing. Once harvested, the Hemp seeds are cleaned and sorted. They are cold-pressed to remove their oil content. The resulting paste is dried, stone-ground to powder and then sieved to increase protein content. Hemp protein is high in Magnesium, which contributes to normal brain function. It is also a source of Calcium, which helps improve cardiovascular health. Organic European raw shelled Hemp seeds. Take 1-2 tablespoons per day. It can be sprinkled on salads, used as a baking ingredient, added to breakfast cereals or mixed into smoothies. 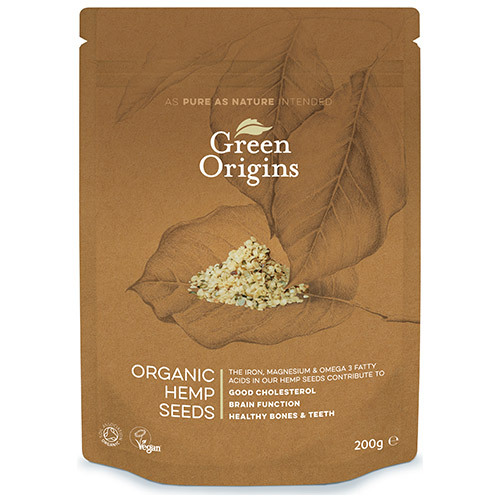 Below are reviews of Green Origins Organic Shelled Hemp Seeds - 200g by bodykind customers. If you have tried this product we'd love to hear what you think so please leave a review. 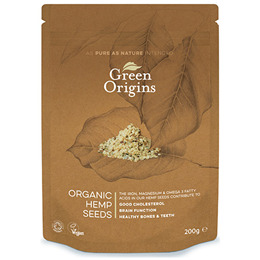 Love the flavour of these hemp seeds. Very healthy and versatile. I put them in all my salads and dressings, pasta dishes and cereals. The kids don't notice when I use them (or haven't said anything negative anyway). A good all round product.